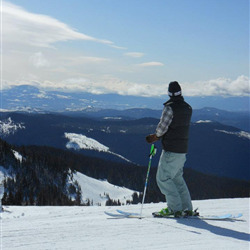 Been an avid skier and wakeboarder for quite some time and wanted to work in the industry. Also been buying gear from evo for quite a while and thought that evo would be a sweet company to work for... the rest is history. The best part about evo is the employees. Everyone is super rad and enjoyable to work with. Atomic, Faction, Black Crows, Look, Inland Surfer, Hyperlite, Ronix, and Liquid Force are just a few of the companies/brands killing it. There's always seems to be some brand that steps their game up. Currently on a pair of Atomic Bent Chetler's with some Rossi FKS 180 bindings...Super fun! So is Baker everything it's hyped up to be?